Despite many major chronic diseases being largely preventable through changes to health behaviours (including poor diet, physical inactivity, tobacco use, harmful alcohol consumption and obesity), only 1.3% of all health spending is currently directed towards prevention programs. In an effort to establish a compelling argument for investment in prevention and to determine how best to target strategies for maximum impact, the Prevention Centre previously supported the Compelling Case Project Phase 1. 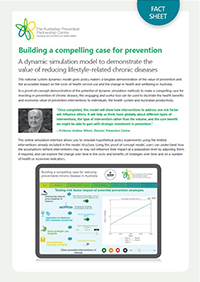 The first phase of the Compelling Case project delivered a proof of concept national system dynamics model of six interacting lifestyle-related risk factors, their related health burden, and several intervention archetypes capable of demonstrating net benefits over the short and long term. It also demonstrated the value of using more textured agent-based models for specific issues at the state and regional level and how these models could interact with the national model to track impacts on local and national performance. Integrate and exercise the agent-based models developed during the first phase (particularly the tobacco and alcohol models) to generate inputs for the national model and derive insights for policy, planning, advocacy, communications and publication in the scientific literature. Like all of our dynamic simulation modelling projects, we are using a participatory approach that builds on knowledge translation methods and brings multidisciplinary stakeholders together to collaborate and explore policy and health service scenarios. The participatory methods place the key stakeholder at the centre of the process. This project will demonstrate to our policy partners that they can apply the national model to support their decision making. We will show that the model can be updated as new data becomes available, making it a long-term decision support asset for best buys in chronic disease prevention and burden reduction. In addition, the national model will be able to be customised and made applicable to different population levels, such as at state and territory level, in the future. We are committed to building internal capacity within state, territory and Commonwealth health departments to improve understanding of the value of these decision support tools and build confidence and competence in interacting with them and their supporting infrastructure.